..at least all life long..
What amazing pearls Christiane Arp is wearing and how imperial and royal Karl Lagerfeld is appearing..
How nice Lady Amanda Harlech is smiling and with which deepness Sébastien Jondeau is looking.. Which elegance the steamship "Schaarhörn" is representing and..
this is a little ode to The Beautiful Life and The Beautiful People.. It was an unforgettable day.. Morning at Café de Flore in Paris, teatime in Luxembourg and evening in the German Alps.. Freedom is the greatest luxury of all..
Live Your Dreams and Be Free.. Perfection forms the raison d'être..
Every second in Paris is like a beautiful dream. 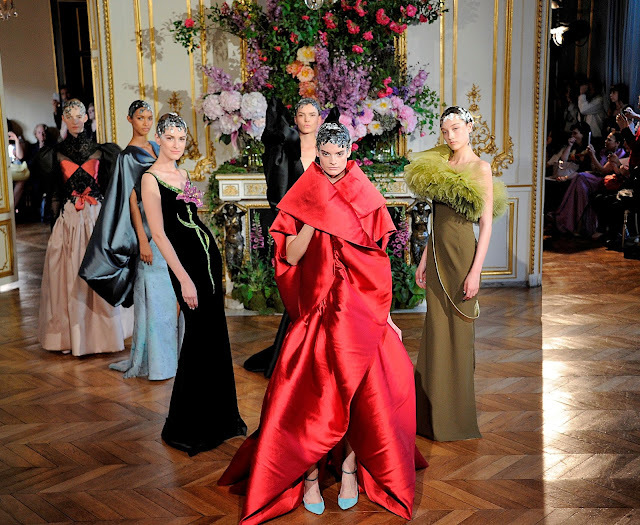 Fulfilled with emotions, inspirations, so unreal, but truly real.. And if you think that it cannot get any better, there comes the Haute Couture season, a cumulation of French genius of which Alexis Mabille delivers the evident proof. True colours, an incredible savoir-faire, enchanting visions come alive. Every second in Paris delivers happiness, if you see what I mean..
Paris is not only the City of Lights.. It is the City of Dreams, the Kingdom of Sophistication, the Empire of Elegance.. Paris is Paris..